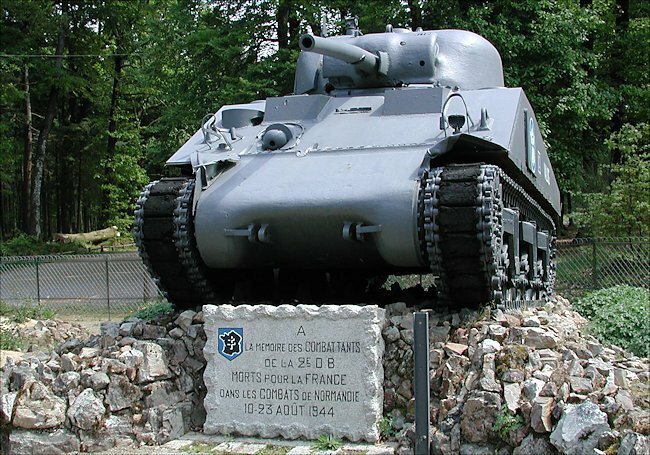 This M4A2(75) Sherman tank is now a memorial to the troops that fought and lost their lives in the battle of the Foret D'Ecouvers in August 1944. It was hit by a number of anti-tank rounds including one in the gun barrel. The Foret D'Ecouvers war memorial is situated where the D26 meets the D226 road. The nearest large town is Alencon to the south. The memorial is situated in the middle of the forest at the junction of eight roads. It is a difficult location to find using a Satnav device as there are no nearby villages. The M4A2 Shermans were equipped with a General Motors 6046 engine (2x GM 6-71 General Motors Diesel engines); they have a welded hull, there were 75mm and 76mm versions only. The users were : USSR, USMC (in the Pacific Theater of Operations), France, Britain, Poland. No US Army combat use. This variant was manufactured by Fisher Body, Baldwin LW, Federal Machine and Welder, ALCO and Pullman Standard (approx. 7053 units produced). M4A2(75). This tank has a 75mm gun, small hatches (protruding hoods), a 57° glacis and dry ammunition stowage bins. Records show that 8,5053 M4A2 tanks were produced between April 1942 to May 1944. This tank was powered by a GM 6046 conjoined 6-71s diesel engine. It had a maximum road speed of around 30 mph (48 km/h). It was armoured with a 75 mm M3 L/40 gun and two 30-60 Browning M1919A4 machine guns: one in the hull and one next to the main gun in the turret. 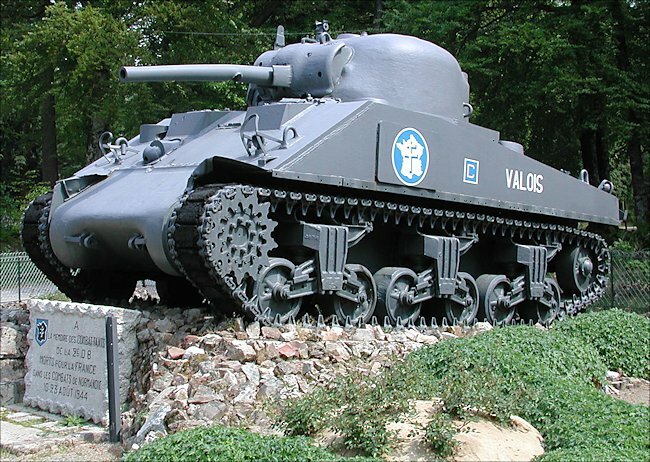 The M4A2 Sherman Valois Tank at the Foret D'Ecouvers Normandy 1944 Memorial, France now guards the eight road roundabout. 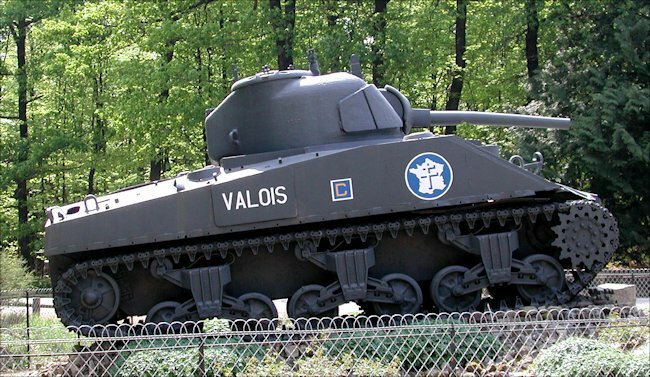 The M4A2 Sherman ‘Valois’ used for the Memorial in the Forest of Ecouvers was knocked out in Tanville. Its serial number is 26875, and was built by the American Company Fisher. 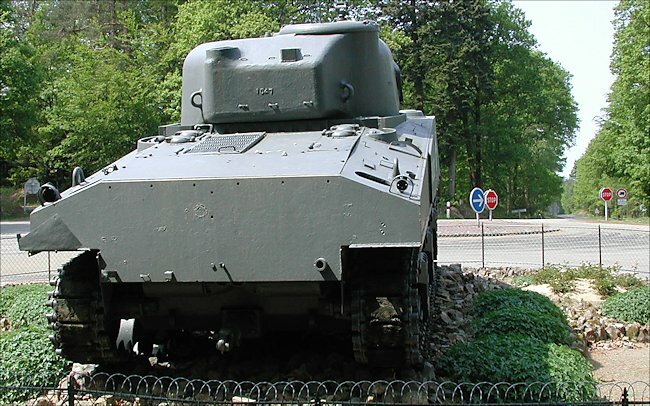 It served with the 12th RCA, 2nd French Armored Division. (But another reord shows that it was with the 3rd Squadron, 12 Regiment of Chasseurs D’Afrique.) What we can be sure of was that this tank was on the D226 road in the Ecouvers Forest when it was hit by a volley of anti-tank guns of the German 9th Panzer Division, 5.45pm Sunday 13th August 1944 that were hidden in the woods. Numerous German soldiers from the 5th Panzer Division took refuge in the forest after 12th August 1944. By regrouping these forces the Germans hoped to stop the Allied attempt to encircle them in the Falaise Pocket. The tank was moved in 1946 up to its present location, the crossroads at Bois-Mellet, to honour all those who fell in the fighting in the Foret D’Ecouvres, it overlooks the main road towards Paris. Three tanks and one halftrack were knocked out that day. Notice the additional side armour to protect the ammo storage bins on the side of this M4A2 Sherman Valois Tank at the Foret D'Ecouvers Normandy 1944 Memorial, France. In August 1944 there was a battle in the forrest of Ecouvers as part of the wider battle for the Falaise pocket. The 2nd French Armoured Division had landed at Utah Beach in Normandy on 1 August 1944, about two months after the D-Day landings. They served under American General Patton's Third Army. Following the recapture of Alençon on 12 August 1944, the Division, led by French General Leclerc, proceeded north towards Argentan. The armoured column entered the forest by the south in order to tackle the 9th Panzer Division, which was hidden in the forest. In Le Gateys, on the only road, a Sherman tank was hit by a German anti tank missile, resulting in the death of Colonel Rémy's eighteen-year-old son, Roger. At La Croix de Medavy, Sherman and Panzers clashed but the French were reinforced by the Putz armoured column which had recently set out from Sées. The following day, on 13 August 1944, the two French armoured columns, named Roumiantzoff and Putz, triumphed. M4A2 Sherman Valois Tank at the Foret D'Ecouvers Normandy 1944 Memorial to the French Soldiers that died in the battle of Normandy.